Not cool for OpenCL applications that require double precision in calculations. Radeon HD 5870 and HD 5850 have the double precision floating point processing support as it’s specified HERE and HERE in ATI Stream acceleration technology section. 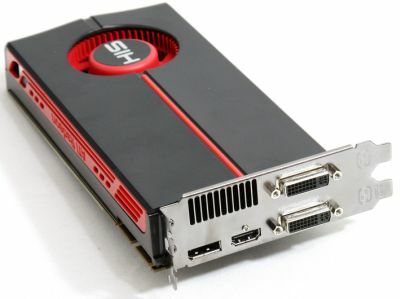 But Radeon HD 5770 and HD 5750 have not this support (see HERE: the double precision is missing). No DP in Opencl. DP for what? Can hardly be marketing, this must enable them to use chips that otherwise would be defect. This is to be expected. Gamers don’t really need double-precision pipeline and I doubt many games will be written requiring double-precision, not even for game physics. Even nVidia has stated that the lower-end Fermi chips won’t have things like double-precision or ECC memory. This is just AMD playing it smart, they made it so that RV800 feature set more scalable so they can better target the different price brackets while maintaining the target margins. 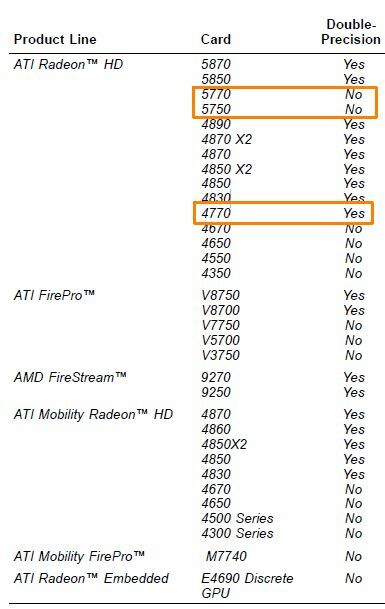 It’s not so surprising at all considering rv740 was rv770 shrinkdown, while this rv840/Juniper is real budget-mainstream card just as rv730 (hd4600 series was). They gone down similiar way when poor old rv530/535 (and later rv630/635) has only 25% of texturing power of their top model. So after all we get decent performing dx11 hype kind of chip that’s only half of gaming power of their bigger sibling. And good way to AMD to get rid of piled stocks of old chips like rv770, and rv790 especially. What is a difference between OpenCL and Double Precision? Would like to see this list updated i f possible. HD5830 should be added as one that DOES HAVE double precision – I know, I use a few. Am curious to know whether the new HD6850 and HD6870 support DP or not.